Legalize marijuana? The case for legalized marijuana with taxes - FreeEconHelp.com, Learning Economics... Solved! "Should Governments Legalize and Tax Marijuana? The war on drugs is an expensive battle, as a great deal of resources go into catching those who buy or sell illegal drugs on the black market, prosecuting them in court, and housing them in jail. These costs seem particularly exorbitant when dealing with the drug marijuana, as it is widely used, and is likely no more harmful than currently legal drugs such as tobacco and alcohol. There's another cost to the war on drugs, however, which is the revenue lost by governments who cannot collect taxes on illegal drugs. In a recent study for the Fraser Institute, Economist Stephen T. Easton attempted to calculate how much tax revenue the Canadian government could gain by legalizing marijuana. The study estimates that the average price of 0.5 grams (a unit) of marijuana sold for $8.60 on the street, while its cost of production was only $1.70. In a free market, a $6.90 profit for a unit of marijuana would not last for long. Entrepreneurs noticing the great profits to be made in the marijuana market would start their own grow operations, increasing the supply of marijuana on the street, which would cause the street price of the drug to fall to a level much closer to the cost of production. Of course, this doesn't happen because the product is illegal; the prospect of jail time deters many entrepreneurs and the occasional drug bust ensures that the supply stays relatively low. We can consider much of this $6.90 per unit of marijuana profit a risk-premium for participating in the underground economy. Unfortunately, this risk premium is making a lot of criminals, many of whom have ties to organized crime, very wealthy. If we substitute a tax on marijuana cigarettes equal to the difference between the local production cost and the street price people currently pay--that is, transfer the revenue from the current producers and marketers (many of whom work with organized crime) to the government, leaving all other marketing and transportation issues aside we would have revenue of (say) $7 per [unit]. If you could collect on every cigarette and ignore the transportation, marketing, and advertising costs, this comes to over $2 billion on Canadian sales and substantially more from an export tax, and you forego the costs of enforcement and deploy your policing assets elsewhere. One interesting thing to note from such a scheme is that the street price of marijuana stays exactly the same, so the quantity demanded should remain the same as the price is unchanged. However, it's quite likely that the demand for marijuana would change from legalization. We saw that there was a risk in selling marijuana, but since drug laws often target both the buyer and the seller, there is also a risk (albeit smaller) to the consumer interested in buying marijuana. Legalization would eliminate this risk, causing the demand to rise. This is a mixed bag from a public policy standpoint: Increased marijuana use can have ill effects on the health of the population but the increased sales bring in more revenue for the government. However, if legalized, governments can control how much marijuana is consumed by increasing or decreasing the taxes on the product. There is a limit to this, however, as setting taxes too high will cause marijuana growers to sell on the black market to avoid excessive taxation. When considering legalizing marijuana, there are many economic, health, and social issues we must analyze. One economic study will not be the basis of Canada's public policy decisions, but Easton's research does conclusively show that there are economic benefits in the legalization of marijuana. With governments scrambling to find new sources of revenue to pay for important social objectives such as health care and education expect to see the idea raised in Parliament sooner rather than later." As you can see in the above graph, we have two different supply curves and two different demand curves. The reason for the shifts is the presence of "risk" in getting caught breaking the law. 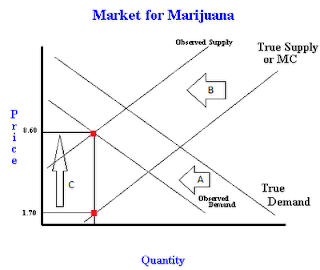 The Supply curve (based on marginal costs) is the one to the right, but shifts left (a decrease in supply) because of the potential costs of getting caught (going to jail or paying a fine is assumed to be a cost). Likewise, demand shifts left as well because of the potential consequences of getting caught with marijuana. We can calculate the "profit" from the sale of marijuana by looking at where observed supply and observed demand cross, and this will give us the equilibrium price paid and quantity transacted in the market. However, since the true marginal cost of producing the drug is much lower than the observed demand, the difference between price paid and cost to produce ends up as profit for the dealer. As stated before, the reason for this "profit" is because of the potential cost of getting caught, everyday a significant amount of dealers are arrested and jailed or fined. Since dealers are still rational, they account for this "cost" by increasing their prices to account for it which results in a leftward shift in supply. As stated in the article, this brings up an interesting opportunity for the government. If they become the suppliers of the good, they can produce on the true supply or marginal cost curve and then replace the "cost" of potentially getting caught with a tax. Since the government is not at risk of being fined or jailed, they can take the surplus from the higher price and add it to tax revenue. Keep in mind that the above analysis assumed zero negative externalities, and a free market (perfectly competitive). In reality, marijuana probably has some negative externalities associated with it, and it potentially a monopolistically competitive or oligopoly type market structure. The legalization of marijuana can open up the possibility to regulate it. That regulation implies the opportunity to tax the drug, and it also makes law enforcement easier. Thanks for sharing crucial info with us...! Thanks for the post. Im a big fan of the blog about medical marijuana card coconut creek , i've even put a little bookmark right on the tool bar of my Firefox you'll be happy to find out! Thanks for sharing this post. I am very interested in this topic. I would like to share my opinion on this. mycannabisclothing you hear the time period "key phrase optimization" or "test key phrase density" do you cringe? Effectively you aren't alone. That's the reason many bloggers simply do not do it. They consider it and its shut cousin search engine marketing as tips. You know I think it be legalized and Alcohol should be banned because it not as much harmful as Alcohol, agree guys?